An album of curious charm and warmth, Bell X1's debut 'Neither Am I' is a record that most of us here in the wonderful world of music thought we would never see following the demise of Juniper a couple of years ago. Juniper were a band that promised the lot. Attitude, songs, poise and even the five-a-side skills of truly great rock stars (or so a former flatmate once said). They were signed up but after a couple of singles (including the memorable 'Weatherman') they entered the file marked "dropped." But they weren't really dropped at all. Frontman Damien Rice went his own way and the rest of the band applied a new moniker and a new sense of direction. After some inspiring live shows in the past year or so their debut album has finally arrived. The first two singles 'Pinball Machine' and 'Man On Mir' promised something special and with 'Neither Am I' that promise is thankfully delivered. But you get a tingling feeling that they could have delivered more. But even so, as an indication to a band finding their feet in major label land, it's a damn sight better than most of the pap that crosses the channel on the back of occasional Top 40 success and an appearance on Jools Holland. And it contains 'Volcano'. The opening chimes of 'Pinball Machine' set the tone of the album. If you were expecting an album choc-a-block with rockers like 'Man On Mir' then you're in for disappointment. The album progresses at a smooth and laid back rate. "I could have been a contender / but instead I'm content" sings Paul Noonan over a delicate backing and if you read into that then you'll find a band at ease. Nick Seymour's production shimmers from the off and straight away the tale of love as, er, a pinball machine endears you to a band brimming with frustration at the finer things in life yet satisfied that, although things can be bad, they can't get too bad. 'The Money' is more subdued than it is live but it still works perfectly, its biting lyrics losing none of their steam. 'Man On Mir' is one of this year's truly great Irish singles and it slots in nicely early on getting the urgency over with early. 'Slow Set' is the first of a duo of slightly whimsical songs, the other being 'Blue Rinse Baby', that take the serious and subdued side away from Bell X 1. Whereas the album flows with a subtle and smooth edge, 'Blue Rinse Baby' recalls the Small Faces messing about with a pissed studio crew, but - as songs about pensioners go - it's one of the best (anyone know any other pensioner odes?). 'Slow Set' is a marvellous ode to that part of teenage life that's lost in today's clubs, namely the nervous circle spinner to Bryan Adams or Glen Medeiros or whoever. It perfectly captures those slow set moments of inadequacy, nerves, meddling friends and dancefloor stiffys. As a look back to a bygone time, it's enough to bring a tear back to any eye that first met on the dancefloor of a disco all those years ago. 'Offshore' is largely forgettable, as is 'Little Sister' where the paranoid lyrics do seem a little dated in the "look I've just read a George Orwell book" sense. But in the songwriting stakes 'Volcano', 'Beautiful Madness', 'Face', 'Godsong' and the terrific album closer 'Deep' showcase a band at their best. 'Godsong' recalls Roger Waters in a way. You could almost picture Waters snarling lyrics of God at the dinner table, the whore in your bed. Beautiful Madness starts with what the Frames would call a perfect opening line with "give me an opinion cos I don't have one". The rest of the song could have been written about the long departed Rice ("you're mad to burn / mad to fly / mad to be saved") but even so a beautiful song pans out in the face of tempers flaring. 'Face' is another wallet bursting slice of a la carte rock and benefits from the presence of Nick Seymour on backing vocals. The one thing it sadly lacks is the sauce. It just needs that extra little dash, that fierceness, that burn that would have made it a meatier prospect. 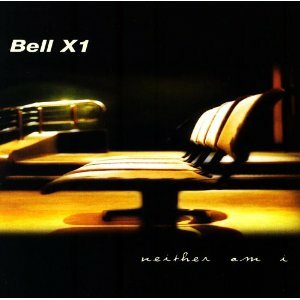 Still, as it is it's another finely tuned and smoothly produced indication that Bell X 1 are something to relish. The shimmering 'Deep' that closes this fine debut embellishes and again could be another written about Rice ("we have one up on each other / the same mistake" could be about Juniper's Polygram days if you like thinking of that sort of stuff). Pink Floyd in feel and execution, it sets the sun nicely on a classy, shimmering album. All in all, Neither Am I is crafted to smooth perfection by the production and influence of Nick Seymour (and probably the Welsh countryside). It's an album that lends itself both to the ear and the brain perfectly, in reverie or in anger. An absorbing, calming listen. However it's a slight shame that some of their live power and Noonan's priceless drumming wasn't let loose in the studio. As a calling card though, it manages to sustain the interest from start to finish and stylishly paves the way for greatness which, if there's any justice, will undoubtedly follow. Check out a CLUAS interview with Paul Noonan of Bell X1.